My name is Lori Whorff, my family and I are located in Winnsboro, a beautiful town in the Piney Woods of East Texas. 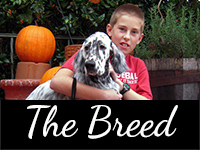 I have been showing and learning about the wonderful breed of English Setters since 2001. I have loved and admired these dogs for many years and it has been a dream come true to be working with them. Now that my two sons, Connor and Jarret, are older, it is a joy that they also share a love for the breed and we can work together! We are extremely careful about the animals that we choose to breed. Before breeding, our dogs must be tested for all recommended OFA health clearances (hips and elbows, BAER and thyroid) and possess the wonderful temperament that is the hallmark of this breed. We also prefer that they be champions of record with the American Kennel Club. 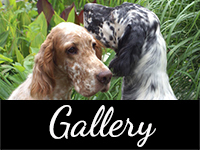 To read my story of how I discovered English Setters, click here. Over the past several years I have spent many hours reading old and new English Setter Association of America Annuals and any other publications regarding the English Setter. I have also spent much time talking with people who have decades of experience within the breed. I am very committed to learning all that I can and doing the very best job that I can at showing, training and breeding these wonderful dogs. I am a member of the English Setter Association of America, the Bluebonnet English Setter Club and the English Setter Club of Canada. 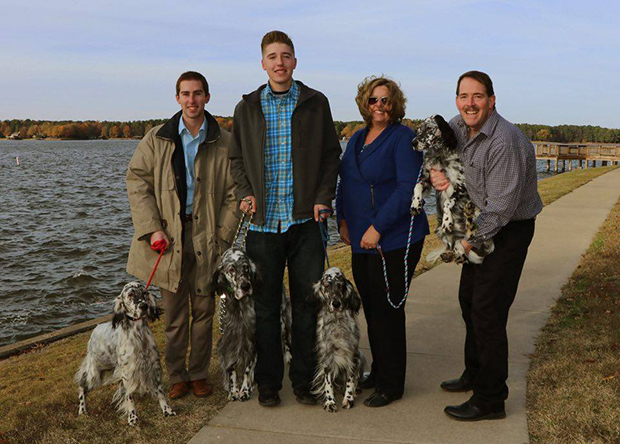 If you would like to learn more about English Setter or inquire about my breeding program, please don't hesitate to contact me. We are planning a new litter in late 2018!